IFF - Let Yourself Go! / Lasciati Andare! This uproarious screwball comedy directed by Francesco Amato, stars the mighty Toni Servillo (The Great Beauty) as an uptight psychoanalyst whose neatly ordered world is thrown upside down when he chances upon a bubbly personal trainer. Dr Elia Venezia, should be unlikeable but instead in Toni Servillo's hands he is tremendously funny. Servillo, who is famous for his dramatic roles shows here why he has become Italy's most bankable star. 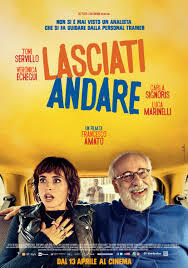 Set in the spectacular backdrop of Rome, with great performances, Freudian humour, and riotous slap-stick gags, this is a great example of a contemporary Italian comedy. Amato's crowd-pleaser is a must-see for audiences looking for quality light-hearted entertainment.